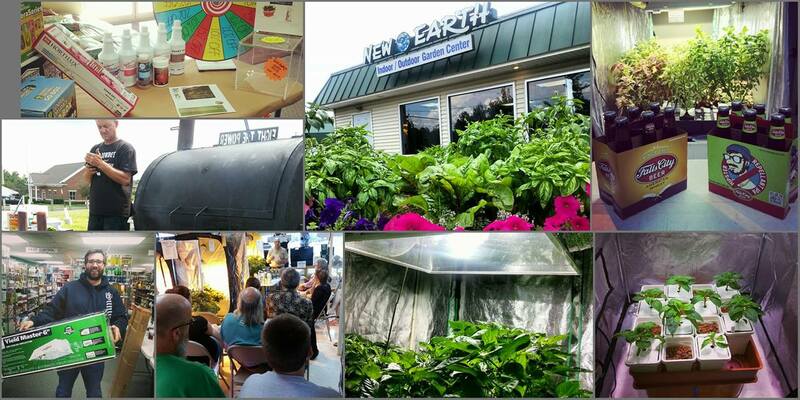 New Earth Blog | Welcome to the Official Blog of the New Earth Garden Center! We are very excited to be the FIRST retail store in Kentucky to partner with Emerald Harvest Nutrients! We had the privilege to meet their president, David Pratt and their head of research and development, Dr. Dave, a few weeks ago. They shared their vision of simplifying application without sacrificing quality. The result is their easy-to-use, but very powerful, line of premium nutrients and supplements. 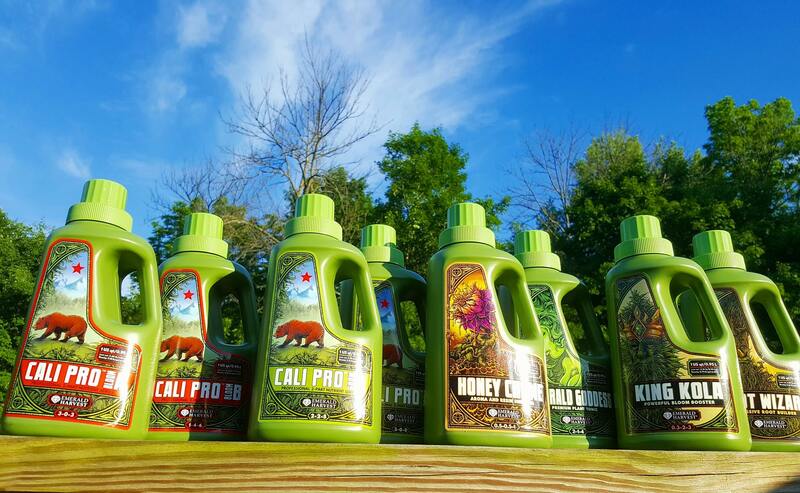 The goal from the very beginning was to make the finest hydroponic fertilizer out there, and to combine the best that nature and science have to offer. Emerald Harvest has base nutrients that are either three parts, Grow, Bloom, and Micro; or a two part Grow and a two part Bloom. The two part base nutrients are for those who want to keep it simple, the three part formula is for growers who want the freedom to fine tune. What sets these nutrients apart is the high degree of chelation and precise nutrient ratios that will minimize the risk of deficiencies. They also have a unique Cal-Mag product that contains kelp extract. Use as needed with any total nutrient, and also use to soak coco coir prior to planting. One of Emerald Harvest’s flagship products is Emerald Goddess premium plant tonic. Emerald Goddess is a very concentrated supplement that can be used alone, but works best when used in combination with their professional base nutrients. Emerald Goddess is a rich, natural tea containing kelp and alfalfa extracts, which contribute additional macronutrients; vitamin B1, and humic acid. Alfalfa and other natural ingredients harness natural plant-hormone processes that aid in photosynthesis, root, leaf, and bud development. This also allows your plants to absorb more nutrients for larger yields and less nutrient waste! 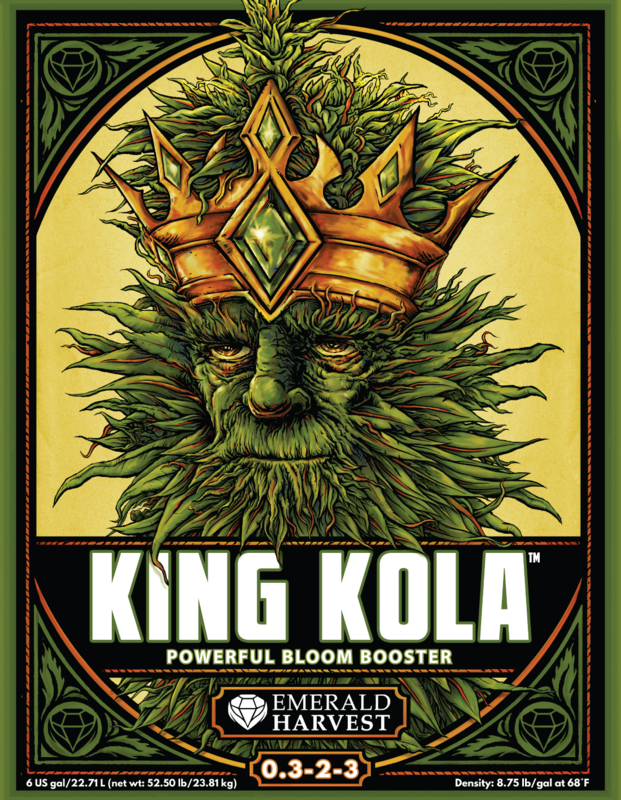 King Kola is a power bloom booster for early, mid, and late flowering. While many other bloom boosters use bovine based proteins, King Kola contains a vegetable source of protein–hemp seeds flour. This is actually more suitable for crops because it more closely matches the protein profile of your plants. 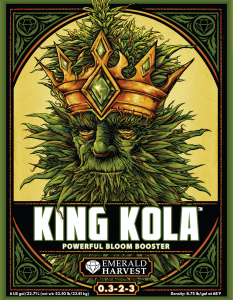 With King Kola, you only need one bloom booster–not three–saving you money. Apply to root zone or use as a foliar spray. 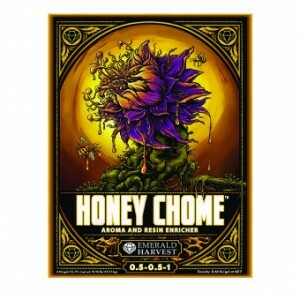 Honey Chome is a resin and aroma enhancer which increases flavor, botanical oils, and color of your plants. It’s combination of cane sugar, palm sugar, and agave nectar provides just the right amount of carbohydrates for a fully functioning rhizospere. sustaining a vibrant microbial innoculant population at root zone. Finally, Root Wizard is a massive root builder containing multiple strains of growth-promoting rhizobacteria. Root Wizard equips plants to absorb nutrients more efficiently, by stimulating plants to expand their root system and and provide a diverse ecosystem right where you want it…at root zone. Use in hydro or soil, also may be used as a foliar spray. Customers have rated Emerald Harvest 5 out of 5 stars. Testimonials of customers speak highly of the fertilizers and the company itself. One customer writes, “Emerald Harvest has covered all the points I value in a nutrient line. The quality and value my garden has now seen surpasses all other products I’ve used! I can’t Thank You enough Emerald Harvest for delivering Simple, Easy, Success through plant based ingredients, you are brilliant…and the HoneyChome rocks!! !” Another writes, “I Love this stuff my plants are super happy and they finish off beautifully it’s priced right the customer service is great”. Give Emerald Harvest a try. We are offering 25% off on all Emerald Harvest purchases through July 31st. We think you will be as impressed with these products as we are! This entry was posted in New and Featured Products, Uncategorized and tagged Emerald Harvest, grow indoors, Grow Lights, grow room, Hydro, hydroponics on June 27, 2016 by Nancy. Spring is right around the corner, and with it comes the emergence of those pesky spring weeds poking up in your lawn. That’s the time to call the lawn care company and have them cover your lawn in chemicals to kill the dandelions, right? Not necessarily… Did you know that corn gluten meal can be used as a pre-emergent herbicide to prevent the growth of these pest plants? When applied at the proper time, corn gluten meal prevents the growth of weed seed, so pest plants have no chance to emerge and take root in your lawn. Get the dandelions before they get you. Studies at Iowa State University have shown corn gluten meal to be an effective preventative against small seeded annual weeds. Proteins within the corn gluten meal inhibit root formation of germinated seeds, killing the newly emerged roots fibers before they get established. At 10% nitrogen, corn gluten meal also provides an excellent source of slow release nutrition, making your turfgrass more lush and competitive against weeds. 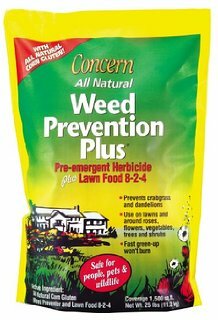 Now is the time to apply, and we have the perfect product: Concern Weed Prevention Plus. This slow release lawn food is derived from corn gluten meal,bone meal, and potassium sulfate and provides not only needed springtime nutrition for your turf grass, but also has the benefit of being a pre-emergent herbicide. Granulated and spreader-ready, an application of 15 lbs per sq. ft in early spring and again in late summer provides continued control of germinating annual weeds such as Dandelions, Smooth Crabgrass, Clover, Purslane, Pigweed, Plantain, and more! Weed Prevention Plus can also be used to control annual weeds in and around flowers, roses, bulbs, and shrubs. Work 20 lbs per 1000 sq. ft. into top 2 inches of soil and water in to activate. Do not apply Weed Prevention Plus to newly seeded lawns until after first mowing. Do not reseed treated areas for a minimum of six weeks following initial application. Come in the shop and let us tell you how this awesome all-natural product can help beautify your lawn and landscape. This entry was posted in New and Featured Products and tagged corn gluten meal, natual lawn care, organic, spring, weeds on March 25, 2016 by Nancy. 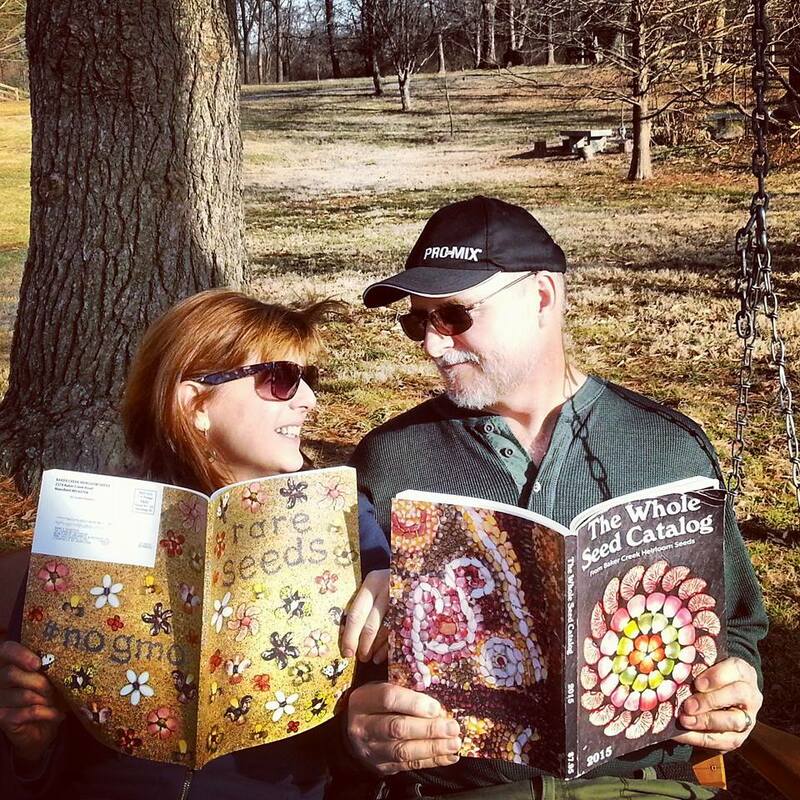 Vance and Nancy looking over the 2015 Baker Creek seed catalogs at Blackacre Nature Conservancy in Louisville..
Our seed swap is coming up and that always generates a lot of seed questions, particularly about seed types: genetically modified, hybrid, open pollinated, and heirloom. GM (Genetically Modified) crops are created by adding genetic material from one species into the DNA sequence of another species. The result of genetic modification by laboratory methods is a combination of genetic materials that could not occur naturally. You will not find GM seeds in a home garden center at this time. Hybrids are developed through traditional breeding, where pollen is moved between members of the same species. Plant breeders carry pollen from one plant to another by hand or with the help of insects to produce controlled crosses of two individual plants. Hybrids are typically bred for increased vigor, pest resistance, larger fruit size, or for the ability to withstand shipping and handling. Hybrid cultivars are developed over many years. A few examples of hybrid plants are Sun Gold tomatoes and many of the “super hot” chili peppers, such as the Carolina Reaper. You cannot save the seeds from hybrid plants for planting, you will have inferior plants that are not true to the parent plant. You are able to root cuttings (“take clones”) if you would like to reproduce a hybrid. You may hear discussion about open pollinated seeds. Open pollination is achieved by insects, birds, wind, or other natural mechanisms. The seeds of open-pollinated plants will produce new generations of those plants. One of the bigger challenges in maintaining a strain by open pollination is avoiding introduction of pollen from other strains. Based on how broadly the pollen for the plant tends to disperse, it can be controlled to varying degrees by greenhouses, tall wall enclosures, or field isolation. Heirloom seeds are open pollinated cultivars that have been kept true to variety, with no cross pollination, through careful cultivation methods for over fifty years. Baker Creek Seed Company is using tent enclosures in its own gardens to house the plants. Bumble bees are then introduced to control the pollination. This prevents cross-pollination from undesirable sources, as well as preventing cross-pollination between strains. Heirloom seeds can be saved and replanted, ensuring a trustworthy supply of family food year after year. When saving seeds, separate cultivars of the same plant variety to prevent cross pollination. NOTE: Both Baker Creek and High Mowing Seeds are Non-GMO Project verified. They are the only two seed companies in the US currently testing seeds at high risk for GM contamination for cross-pollination with GM varieties. SEED STARTING VS BUYING PLANTS: Benefits of seed starting include increased variety of plants to choose from, having complete control over what is used on your plants, and quite often, healthier plants to start your garden. Healthier starts = healthier and better garden performance, and better harvests. More and more plants are available that are locally grown and organic, or at the very least, not sprayed with pesticides. Starting your own plants is not difficult with the right equipment and space, primarily a grow light of some sort and a warm area. This entry was posted in Plant info and reviews, Uncategorized and tagged baker creek, heirloom seeds, Kentucky, Louisville, organic gardening, seeds on January 21, 2016 by Nancy. This is the event that we all look forward to with great anticipation each year. What a great way to kick off spring (albeit a little early! 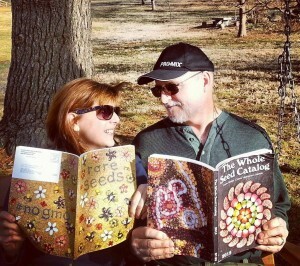 ), sharing seeds and garden stories with like-minded gardeners. Expect a diverse crowd of experienced gardeners and seed savers, and those hoping to gain wisdom. Bring seeds you have saved in years past, and extra seeds from packs that you have leftover from last year. If possible, bring snack-size ziplocks or coin envelopes for seed swapping, and a sharpie to label your seeds. We hope to see our seed swap regulars as well as many new faces this year. A short seed starting workshop will begin at 5:30, swapping commences at 6:15. As is tradition, we will be having a gift card raffle, lots of special deals for swappers who wish to grab some supplies, and some beverages for all those who attend. Feel free to bring a snack to share, or contribute something to the community. Over the years we have had folks bring goodies, handmade soap, honey, and homemade ginger beer to share with other swappers. If possible, please RSVP to our event on Facebook so we have a general idea of how many people to plan for. Thanks and hope to see many of you on the 30th! 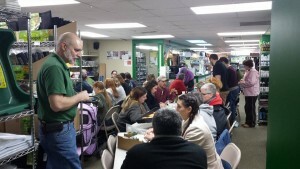 This entry was posted in Events, Workshops and Seminars and tagged heirloom seeds, Kentucky, Louisville, New Earth Organics and Hydroponics, organic, Seed Swap, workshop on January 12, 2016 by Nancy. Many of you met and had the opportunity to chat with the guys from NextLight, when they came to Louisville to hang out during our Customer Appreciation Day. They educated over 30 folk with a workshop on PAR and LED lighting, spoke with another 200 on their company specifics, and GAVE AWAY one of their incredible NextLight LED grow lights to a very fortunate customer. He was understandably thrilled, and reported just days later that, “I love the light!! I can already see a major difference.” We have had so many questions about NextLights since November 7th, we thought we would share the story behind the NextLight. 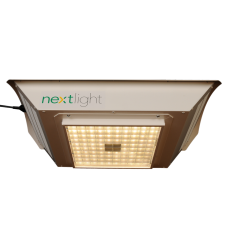 If you missed Rand’s NextLight workshop, you can catch him on this quick YouTube video sharing the highlights of the NextLight LED grow light system. In 1997, Nick Brumm, the founder of NextLight was living in San Rafael, CA and happily working for Diamond Lights in sales and product development. One day, Nick visited a commercial tomato greenhouse in Sonoma, CA and everything changed. He saw his future in the commercial greenhouse industry and resolved to get an engineering degree to make it happen. In 1999 Nick began his Mechanical Engineering degree at UC College of Engineering. Throughout this time he took on several co-op rotations at GE Aviation doing: Advanced Controls, Secondary Flows (turbine cooling airflow simulations), Product Support Engineering with M&I Aeroderivatives, and Controls Fuel Systems. He graduated in 2005 with 3.5 GPA and went to work for architectural and engineering firm doing HVAC design and controls for commercial food production facilities. He also began taking all of his combined knowledge and using it to develop a business plan for a commercial greenhouse of his own. Nick quickly found investors and started work on the design. By the end of 2006, however, it was clear the economy was taking a turn and the greenhouse plan was shelved. Nick knew first hand that the costs to run a greenhouse were too risky in this climate. However, every few weeks or so, his mind would drift back to his dream and he would challenge himself to find ways to reduce cost. While the economy recovered, Nick went to work at Belcan as a contractor for GE Aviation. He held positions in Mechanical Systems, Controls Systems and finally Systems Engineering. The Systems Engineering position led to a direct hire at GE Aviation in Engine Systems as the Model Owner of the LEAP-1B Externals Integration. The LEAP-1B program is part of the GE Aviation New Product Integration group which is the heart of future growth and revenue. Basically, it is the ideal group to work in when seeking to gain knowledge around: integration, production schedules, manufacturing & testing of new engines and design development. In 2010 amidst this rapid career growth, Nick had a lightbulb moment. While looking at a Reef Tank forum, he noticed a few members building custom LED systems to light their coral reefs. They sought to reduce power consumption as well as heat, that were both issues with the metal halides that were typically run on large reef systems. Excited, Nick started doing research and ordered some LEDs to begin his own experiment. Nick discovered that he could in fact cut the cost of electricity. In fact, the power it would take to run the lights in his greenhouse could be cut in half. Labor and the cost of running lights were the two biggest expenses in the plan. With LEDs he could effectively reduce the overall cost of each plant by 25%. Nick began looking for an LED grow light that could do exactly what he needed, but all he found were purple lights. It was then that he backtracked the development of the purple lights and found they were all making the same assumption about plant growth. They assume that you can target certain colors to power the photosynthetic response curve. Nick saw this as a poor assumption — the entire commercial greenhouse industry and every hobby grower alike have been using Metal Halide and High Pressure Sodium lights for 30+ years with fantastic results. These same white lights do not match the “ideal” curve claims of the purple LED makers. Having worked in the grow light industry a decade ago, Nick had already seen the quest for the “perfect spectrum” and found it to be a gimmick rather than a scientific pursuit. With all of this in mind, Nick went in a completely different direction, seeking to make his lights as close to HPS as possible. Nick started the NextLight in 2011 and has compiled years of development — all the while being trained to launch a complex high tech new product by one of the largest corporations in America. The light that Nick has created took design and development to the next level. And it was accomplished from a clean sheet of paper. This entry was posted in grow lights, New and Featured Products, Uncategorized and tagged Customer Appreciation Day, grow indoors, grow light, Grow Lights, grow room, grow your own, hydroponics, learn how to grow indoors, LED, lighting, New Earth, NextLight on November 17, 2015 by Nancy. Save the date, you don’t want to miss this event! We will be here from 10-6 on Saturday, November 7th, with visiting industry experts from HORTILUX, SUNLIGHT SUPPLY, HYDROFARM, CUTTING EDGE SOLUTIONS, SUNLEAVES, FOXFARM, BOTANICARE, HYDRODYNAMICS INTL and NEXTLIGHT. What a great opportunity to attend their FREE workshops, hang out and ask questions, pick up lots of samples, and hopefully get in on the $3500 in raffle items we will be giving away that day. A NextLight 525 watt LED grow light valued at $1295, a sweet HPS 1000 Grow Light from our friends at Sunlight Supply, retail $300, a Secret Jardin Grow Tent from Sunleaves and Partner Brands, two hydroponic systems from Hydrofarm, the Emily’s Garden and the Mega Garden, 2 sets of Power Veg lamps from Hortilux, a Super Sprouter Kit from Sunlight Supply, Lots of Cutting Edge Solutions and Fox Farm products, Grodan Rockwool, and plenty of Tshirts and surprises. You get a raffle ticket just for coming, and raffles will be going on all day. LOTS of fertilizers, soil, T-Shirts and surprises still coming in! We are excited about our extensive workshop schedule. This is the biggest educational event for indoor gardening and hydroponics in the southeast. People talked about last years’ educational workshops all year…and this year we have more, with several new topics. Check back for workshop updates. We will have free beer and other beverages, 21 and over. Plenty of non-alcoholic drinks for you, too. This is a family friendly event. 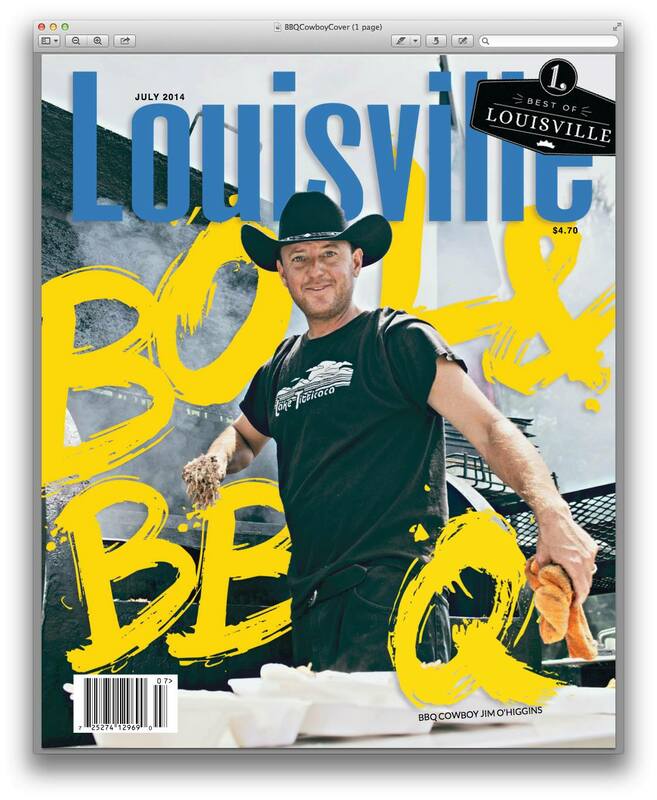 Holy Smokes, the BBQ Cowboy, who was featured in Louisville magazine will be here with his smoker cooking up some incredible, smokey, deliciousness. He will be selling (huge) plates for $8.00. We will be giving BBQ credits away with all purchases over $50 so you can eat on us when you make a purchase on the 7th! This entry was posted in Events, Uncategorized, Workshops and Seminars and tagged CAD, Customer Appreciation Day, Cutting Edge Nutrients, free beer, grow indoors, Grow Lights, grow shop, grow your own, Hortilux, hydroponics, Kentucky, learn to grow, Louisville, New Earth, samples, workshops on October 21, 2015 by Nancy. MS, HPS, T5…if you want to grow indoors and these abbreviations are confusing, then this is the workshop for you! Vance and Terry will be showing you how to set up a productive grow room and how to start growing indoors. They will cover Metal Halide, High Pressure Sodium, and High Output Fluorescent lighting, as well as other important factors in successful, indoor gardens. Our good-better-best approach helps you make the best choices for your budget for lighting and accessories. We will start from the ground up with setting up grow rooms, hydroponics or soil, bringing plants in from outdoors, and how to set up incrementally. Whether you want a kitchen herb garden or a basement full of veggies, if you have questions, this workshop is for you! All workshop participants get 20% off their purchases after the workshop. This entry was posted in Events, Uncategorized, Workshops and Seminars on September 9, 2015 by Nancy. We have a special buy and want to pass that on to you! These Solar Flare T5 High Output lighting fixtures with lamps are just what you need to set up a small indoor grow room, or expand your cloning, seed starting, or growing areas. Hang vertically or horizontally. Advanced wide T5 optical design for maximum coverage and diffusion. Pre-wired with 8 ft power cord for ease of use. Highly reflective aluminum insert for maximum performance. Cool operation housing design to keep electrical components thermally stable. 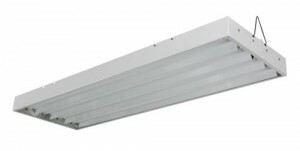 Includes Spectralux® 54 watt T5 HO 6500°K Blue lamps. High lumen per watt rating at 5,000 lumens per lamp. Energy efficient electronic T5 ballast. The 8 lamp fixtures has dual on/off switches each operating four lamps. The 4 lamp fixture has an on/off switch controls all four lamps. One year warranty on lamps. Limited quantities, while they last, 4 Lamp/48″ Solar Flare is $109.99; 8 Lamp/48″ Solar Flare is $179.99. Not sure what you need? Call us for a free consultation. This entry was posted in New and Featured Products and tagged Grow Lights on August 19, 2015 by Nancy. This is a long-awaited group trip to see some Aquaponic farms, Lexington is about an hour drive from our store. Hope you can make it! We will be meeting at 11:30 sharp at New Earth to caravan/car pool to Food Chain in Lexington, Kentucky. 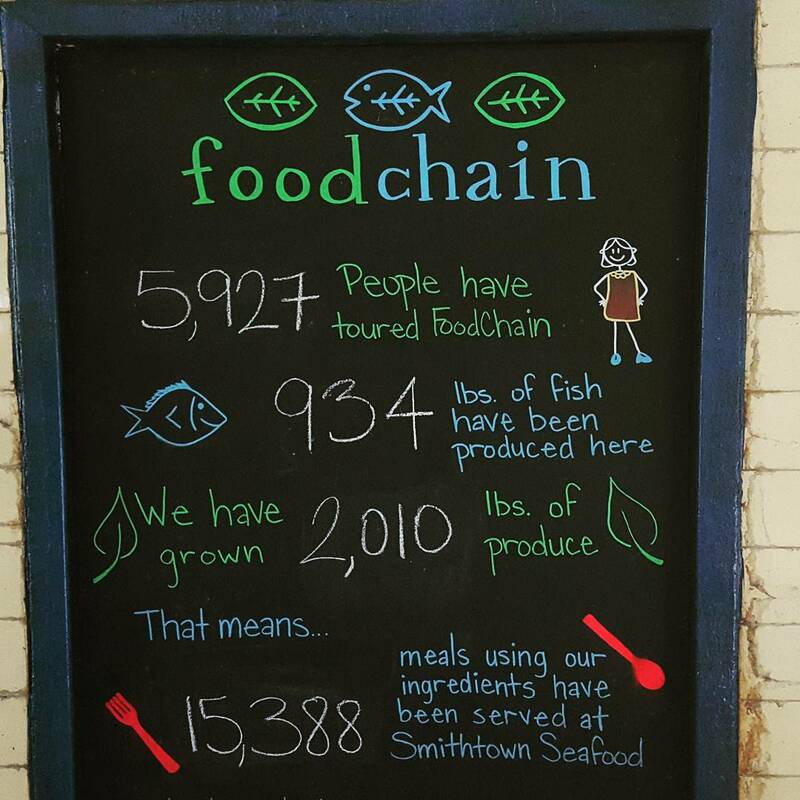 We will eat at Smithtown Seafood after our tour, where they prepare and serve Food Chain Tilapia and produce, as well as other local choices. After lunch we will head over to Bluegrass Aquaponics for a guided tour of their commercial greenhouses; question and answer with the owners will follow. Those not wanting to caravan are welcome to meet us at Food Chain at 12:45pm ET in Lexington. 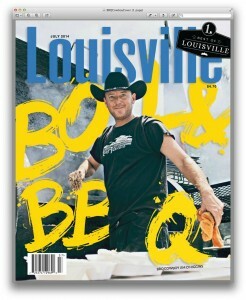 Expect to be back in Louisville around 5:30 – 6:00pm. Total cost for both Aquaponic farm tours for adults will be $15 plus lunch. Our Food Chain tour starts at 1:00pm and tour cost is $10 adults/$5 youth. 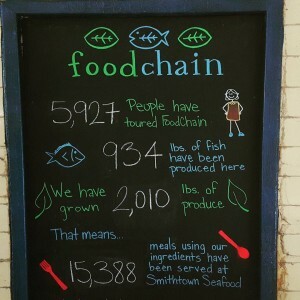 Food Chain is a non-profit that provides education and hands-on training for indoor, sustainable food production and processing. They are the first in Kentucky to do an aquaponic system like this totally indoors, under lights. 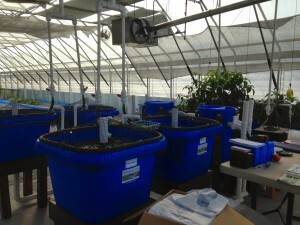 Bluegrass Aquaponics is a family owned, commercial aquaponic greenhouse . They grow Tilapia, greens, swiss chard, herbs, kale, and other produce in integrated systems that are a cross between aquaculture and hydroponics. Come see how one family is making their unique business vision succeed with hard work and creative marketing. We will be visiting their location after we tour Food Chain and have lunch, around 3:30pm. Expect the tour to take about an hour; produce and fish will be available for purchase. Tour cost is $5 per person. 11:30am Those caravanning and carpooling will be leaving the New Earth parking lot. 12:45pm Meet at Food Chain for 1:00 tour. 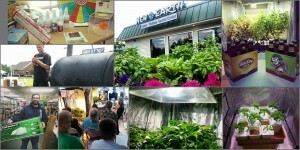 This entry was posted in Events and tagged aquaponics, bluegrass aquaponics, food chain, hydroponics, New Earth, road trip on August 3, 2015 by Nancy. 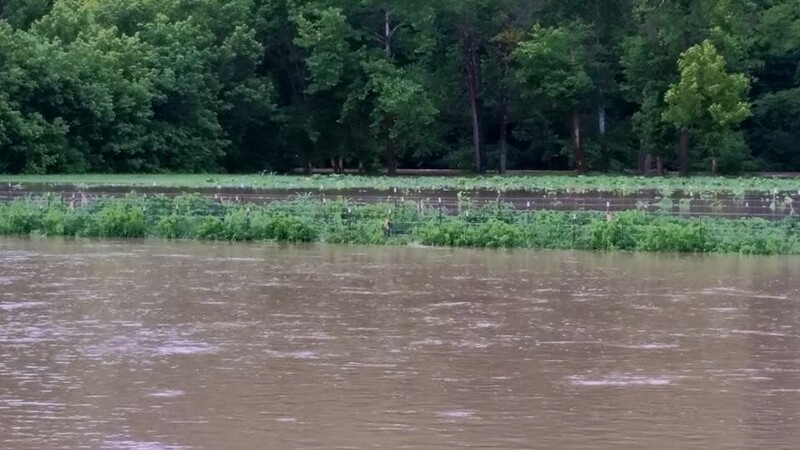 Our friends at Nation Family Produce have suffered a total loss from flooding this year. Dr. Ray Rothenburger from the University of MO Extension office, covers this topic thoroughly, so without added input I will let the article speak for itself. “Extended periods of wet weather with persistent rains may be the cause of some plant problems even though plants may not be flooded. Although there may not be any visual damage at this time, a tree or shrub may have experienced root damage, disease or other damage during the very wet period. Most often there is suppression of the root system. After the wet weather has subsided, assess all plant growth and examine for any weak or reduced growth. If there is an indication that a plant may have been weakened, some special summer care may be needed. One of the most common reasons for the suppression of plant growth during very wet periods is the reduction of oxygen in the soil that is available to plant roots. Plant cells respire and need oxygen to survive and grow. While we breathe oxygen from the air that is then distributed throughout our body, plant cells must get oxygen from the air that is close to the cells. Oxygen of the air in the soil is not as high as oxygen of the air around us. If the soil air drops to less than 12% oxygen, roots will suffocate and die. Excess water in the soil forces out soil air. When there is less air available, the oxygen is rapidly used and becomes inadequate for good root growth. Also, in very wet soils organic matter begins to decompose and this process also further depletes oxygen in the soil environment. 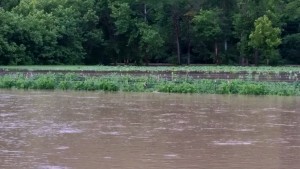 Plants in standing water or highly saturated soils will lose some of their deeper roots first, but as the condition persists, shallower roots may also be damaged. The greater the number of roots killed, particularly the small feeder roots, the greater the stress on the plant after conditions dry. Plants may maintain abundant leaf cover during wet periods, but if the root system has become reduced, under dry or hot weather wilting, leaf scorch and die back may develop. Newly planted trees and shrubs may have been unable to produce abundant new roots as would be possible under more normal conditions. Water uptake in plants decreases within an hour after the soil oxygen drops below the critical level. Consequently, a plant will wilt even though there is moisture than enough water in the soil. If newly planted trees or shrubs are subjected to this condition, the new roots that help them get established after transplanting will become oxygen starved and die almost as soon as they are formed. Plants that have lost roots during wet periods are not well prepared to face summer heat or drought. If the summer remains fairly moist and cool, few problems may be noticed as plants gradually recover. However, if weather becomes very severe, many trees and shrubs will show damage or may even be killed. These same conditions may develop if plants are overwatered after transplanting even though soil moisture naturally may not be excessive. Watch plants carefully during the coming months, particularly those that have been planted this year or during the past few years. Water them promptly during hot or dry periods. Normally, an inch of water per week during normal summer weather either as rainfall or irrigation is adequate. Water well, but avoid frequent light watering or adding excessive amounts at one time. In addition to root problems, diseases often get established on leaves or roots of plants during extended wet periods. Sycamore anthracnose has been serious in many areas. Black spot of roses has also become well established in some gardens. Grass in the lawn is also subject to certain diseases that could have become established during the frequent rains. These problems are good reasons for close observation of landscape plants and lawns during this month. If any dead spots, die-back, leaf spots or other disease problems become apparent, whatever the plant, prompt action is important to prevent more severe damage. A fungicide approved for use on the damaged plant should be used. For these types of diseases, liquid sprays are generally more effective than dusts. In some cases, such as apple scab on flowering crab apples, it is too late for control measures when disease damage can be seen. This entry was posted in Uncategorized on July 16, 2015 by Nancy.